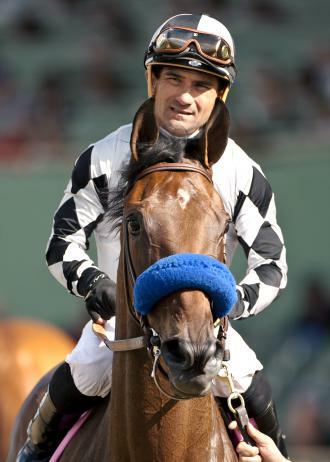 DEL MAR, Calif. – Jockey Corey Nakatani will be sidelined for an undetermined period of time with back injuries sustained in a two-horse spill in Saturday’s 10th race at Del Mar. Nakatani, 47, was hospitalized overnight on Saturday and was scheduled to return to his home in the Los Angeles area on Sunday, according to his son and agent, Matt Nakatani. Matt Nakatani said his father has been diagnosed with a herniated disc and severe cervical stenosis, or narrowing of the space within the spine, that will require surgery. “My dad is in good spirits and resting well,” he said. Jockey Geovanni Franco was involved in the spill but was released from the hospital on Saturday evening and worked horses on Sunday morning at Del Mar. The spill occurred in early stretch of a turf race. Irish Spring, ridden by Corey Nakatani, appeared to clip heels with Aussie Fox, who drifted to the inside into Irish Spring’s path. Irish Spring fell heavily, unseating Nakatani. Bitter Ring Home, ridden by Franco, was unable to avoid Irish Spring and fell, unseating the rider. Immediately after the spill, Franco rose briefly and then quickly sat down. Nakatani crawled on his arms and legs to a position under the rail, where he received medical attention. Both riders were placed on support boards and taken from the track on stretchers. Irish Spring died as a result of injuries sustained in the fall, according to track officials. Bitter Ring Home ran loose and was caught by an outrider. Aussie Fox, who finished third under apprentice jockey Assael Espinoza, was disqualified and placed 10th, the last of the finishers in the 12-horse race. On Sunday, Espinoza, 18, was given a suspension of 10 racing days from Aug. 12-25 by track stewards for causing interference that led to the accident. Espinoza is considering an appeal of the suspension, according to his agent, Brian Beach. Beach said Espinoza would discuss a possible appeal with his father, Leo, and uncle, Victor, the Triple Crown-winning jockey who is sidelined after suffering a neck injury in a training accident here on July 22. The suspension was longer than expected, Beach said.